Happy New Year from Panama! Whoever thought the Pedersens and cats would spend a New Year’s Eve in west of nowhere, Panama! 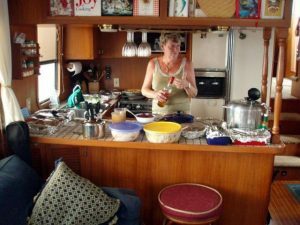 Yesterday marked our first “cruiser” Thanksgiving, and as we had the most galley and salon space, we served as the mothership for the flotilla in Utilla, hosting folks from four other boats for the potluck: Tempest, Wind Free, BabSea (who was with us at Tijax) and Connie Marie. New Emma Jo guests for dinner record: 12 total.